With the New Hampshire winter beginning with snow, we are preparing for Holiday Camp and hoping that the snow will stay so that we can do some sledding. We also hope for no rain!! 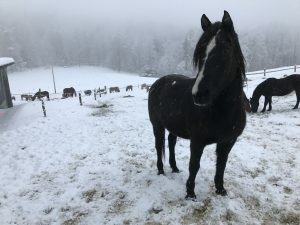 During the winter months, the rain combined with the cold weather always creates ice, which is unpleasant for the horses and us people. We are one week away from Holiday Camp and are incredibly excited for thirteen campers to join us. We have a few counselors visiting as well for this camp, and we are equally excited to see them! Campers, staff, and families associated with Road’s End Farm are what make this place possible. We love getting visits and seeing members from our extended camp family!